You can also download the entire Pericles translation as a PDF! The narrator, Gower, explains the story's setting in Antioch, where Pericles goes in search of a bride. Pericles solves the riddle, revealing Antiochus's incestuous relationship with his daughter, then is forced to flee. Back in Tyre and afraid for his life, Pericles decides to travel across the sea, leaving Helicanus in charge. Antiochus's henchman arrives in Tyre to kill Pericles, but the prince is nowhere to be found. Pericles travels to Tarsus, where he rescues Cleon, Dionyza, and their subjects from famine. Gower describes Pericles's popularity in Tarsus. In a dumb show, Pericles sails away and is shipwrecked. Pericles is shipwrecked alone in Pentapolis. Fishermen tell him about a tournament, then pull his armor out of the sea. King Simonides and Princess Thaisa watch the knights enter the tournament, including the "stranger," Pericles. Pericles's victory in the tournament is celebrated with a feast; he and Thaisa quickly fall in love. Back in Tyre, citizens ask Helicanus to become king, but he insists they wait a year while they look for Pericles. As a joke, Simonides pretends not to approve Thaisa and Pericles's marriage, then oversees a quick wedding. Gower explains that Pericles and a pregnant Thaisa sail for Tyre and are caught in a storm. Pericles and Thaisa's ship is caught in a storm. Thaisa gives birth, is declared dead, and is thrown overboard. Thaisa's body washes up in Ephesus, where a magician named Cerimon revives her. Pericles stops in Tarsus, where he leaves baby Marina with Cleon and Dionyza. Thaisa decides to become a priestess in Diana's temple in Ephesus. Gower explains Pericles's return to Tyre, how Thaisa becomes a priestess, and that Dionyza is planning Marina's murder. Dionyza hires Leonine to murder Marina, but pirates kidnap the princess just as he is about to do it. In Mytilene, the Bawd and Pandar buy Marina from the pirates, forcing her to become a prostitute. Cleon berates Dionyza for Marina's murder; they tell Pericles she died by accident. He grieves. Gower describes how Pericles sails to Tarsus to fetch Marina, is told she's dead, and sails away in despair. Two gentlemen rave about Marina's "preaching" in the brothel, which has changed their lives. Marina refuses to sleep with Lysimachus, governor of Mytilene. She convinces the Bawd and Pandar to let her go. Gower explains Marina's success as a tutor for rich children, and that Pericles's ship approaches Mytilene. Helicanus and Pericles arrive in Tyre. Marina sings to cheer Pericles up; he realizes she is his lost daughter. Gower asks the audience to imagine the celebrations Lysimachus put on to honor Pericles, and the journey to Ephesus. 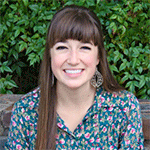 Pericles reunites with Thaisa at Ephesus, Marina and Lysimachus are engaged, and everyone is free to return home. Gower wraps up the play, describing Pericles and his family's happiness and Cleon and Dionyza's fate. Sincox, Bailey. "Pericles Translation." LitCharts. LitCharts LLC, 19 May 2017. Web. 20 Apr 2019. Sincox, Bailey. "Pericles Translation." LitCharts LLC, May 19, 2017. 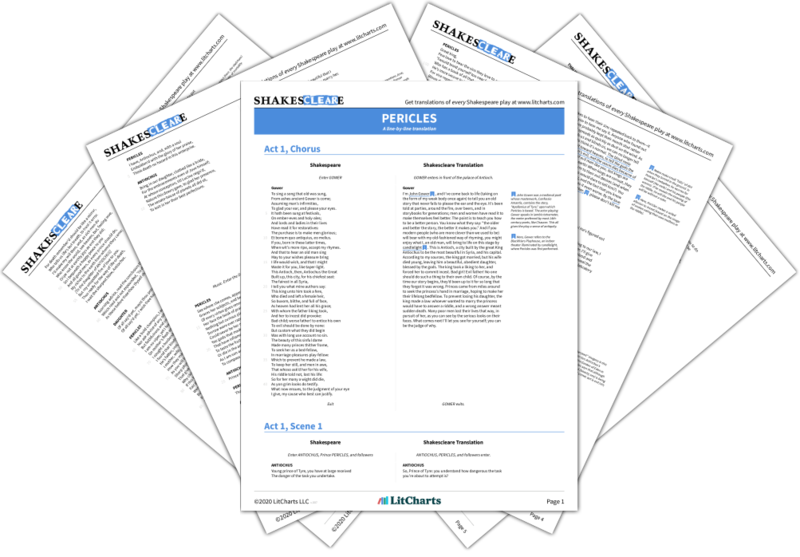 Retrieved April 20, 2019. https://www.litcharts.com/shakescleare/shakespeare-translations/pericles.